As you approach the property through an arched gateway you enter a unique and special location. A tree lined drive leads you down to this magnificent property and gardens. The Moulin de la Roche has its own 1.5 kms of stunning river frontage. The gardens leading to the river are surrounded by fields and woods which are home to an amazing collection of wildlife fauna and butterflies. The river is good for swimming, canoeing and fishing. The property is owned by two professional artists currently living in a nearby hamlet. The location is truly idyllic and perfect for painting and sketching. Art classes for painting & sketching can be arranged on request. 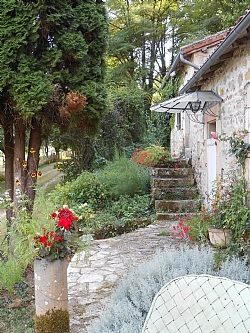 The gite is well provided and maintains an old style character with all the comforts of modern living. Terrace with stunning view of river and islands. 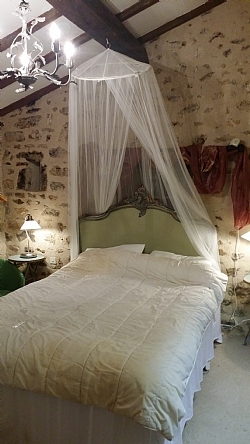 Le Moulin offers accommodation for two people with a French Boudoir Style Double bedroom with hand painted 'Armoir'. Extremely romantic and private. French windows lead out to a small terrace and steps to garden and river. Bathroom facilities offer an extremely modern stylish 'wet room' shower. Towel rail, sink & toilet. The Kitchen is well stocked with cooker, hob, fridge, microwave, dishwasher etc. There is a Utility Room with an extra fridge/freezer, Washing machine, Ironing board & a toilet off. The living room has a hand painted table & chairs, a ‘French Style’ 3 piece suite, Woodburner, TV, Chandelier, original Paintings and artwork. White Egyptian cotton Linen & Towels provided. The River Gartempe is an extremely clean and healthy river offering the enthusiastic fly and coarse fishermen a unique opportunity try for Salmon, Trout, Grayling, Pike, Carp, Bream and Zander. If fishing is not your thing the river is also good for swimming. An Indian canoe is available. Abundant bird-life/wildlife/flora/Fauna within the open field and woodland adjoining the property. Artists and photographers are particularly welcome. This a most stunning location to spend your vacation. The perfect spot to unwind from the stresses of modern day life.